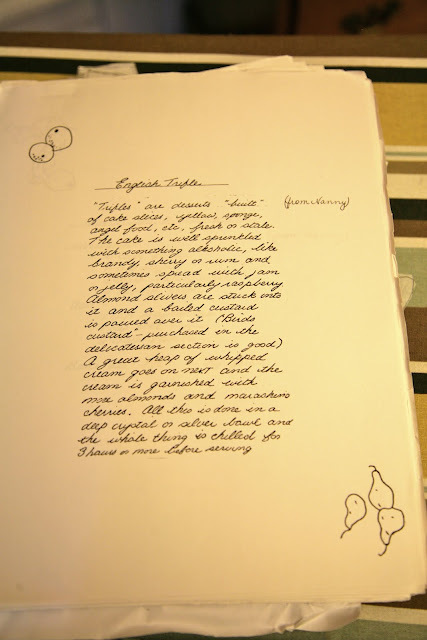 Inder Loves Folk Art: Nanny's Recipes. Recently, I have been following Jeannie from Life on the Clothesline as she tries out some of the recipes in her (great-grandmother) Gram's Cookbook. These recipes were written down in 1916, although many of them are family recipes that date back much earlier than that. Jeannie hasn't just documented her Gram's recipes: she researches many exotic-to-me ingredients (suet) and exotic-to-me processes (like mince-meat and steamed pudding), which makes for fascinating reading even if you don't plan to make mince-meat pie this week. What's funny is that I've been reading and enjoying these posts for a while now, but I completely forgot that I have a stash of photocopied recipes from my paternal grandmother, mostly from the 1940s and 1950s, that may not be quite as picturesque to look at, but also includes a good amount of suet and steamed pudding. Imagine my delight when, a few weeks ago, I found a stack of recipes in my grandmother's distinctive (and beautiful) handwriting under some ancient bank statements in my filing cabinet. My Auntie Gillian copied these recipes and sent them to me years ago; I promptly tucked them away safely in my filing cabinet and forgot about them. My grandmother, Wendy Joy Herd, whom we called "Nanny," was a London girl turned GI-bride. My grand-dad, William Herd (we called him "Pappy"), served abroad in World World II, and met my grandmother at the office where she worked during the war. Their courtship was romantic and brief. They married in London during the war, and then they had to wait until the end of the war in Europe to see each other again. After that, they lived in rural Pennsylvania (where my grandfather grew up), France, Germany, and all over the United States. My grandfather was a career Army officer, so my dad and my aunt grew up as "army brats." On the left is Nanny as a young mother. On the right is my dad and my Aunt Gillian. Isn't that shag carpet great? An aside: I credit Nanny for much of my love of the domestic arts. She was superb needlewoman, knitter (she famously perfected her knitting skills in bomb shelters during the Blitz), baker of desserts extraordinaire, lover of children, and all-around perfect grandma. This is evidenced by the "Wendy Joy"s scattered all over my family tree. Everyone wanted to name their little girls after Wendy (of course, Wendy Joy is also a beautiful name, so I'm sure that didn't hurt). Nanny's notes on her recipes reflect her constant movement. Many of them came from her time in Pennsylvania, but others were borrowed from friends in France, Germany, and various Army bases in the United States. As I read through these recipes again, however, I was most struck by the very English recipes. Like English trifle. I remember being just awed by this as a child. I get hungry just looking at this one. This one makes me very curious. "World War 2 Ration Cake." Presumably this made good use of rationed staples during the war. It calls for cold coffee (a frugal use of leftover coffee); it also calls for a cup of mayonnaise, which is not an ingredient I usually associate with cake! I might have to try this just to see how it tastes. The collection also includes other English classics like Yorkshire pudding, Cornish pasties, and plenty of steamed puddings (English "puddings" are a bit different than American pudding). Most of these recipes assume that you know what you're doing, at least to some extent. Instructions like, "Bake at 375 - Refrigerate" are common. How long do you bake the cake, Nanny? Well, until it's done, of course. In this respect they are a bit intimidating. Also, a startling number of her recipes call for suet, which was beef or mutton fat, not an ingredient that modern cooks use frequently. Does anyone know if I could substitute butter or shortening for the suet? As a lifelong vegetarian who has only recently starting eating very select types of meat, I don't see myself cooking with mutton fat anytime soon. I was so excited to see these again*, and I can't wait to try them out! * Although seeing her handwriting and writing this post made me miss Nanny even more. Sigh. What a treasure trove! Cake with mayonnaise... bizarre but fascinating since that must've been something from the rations and people just made do. I would imagine you could substitute another 'solid fat' like butter or shortening for the suet. I've made Christmas puddings with butter, which always traditionally used suet. Family recipes are marvellous. My mum makes chutney from my great grandma's recipe and I will have to learn one day. Ooh, I think we might have a family chutney recipe too, although I don't have it. Must find that! I love chutney! Yum. I've made a couple of recipes that required suet, and I was able to just get it from the butcher at the grocery store. I'm pretty sure they make a vegetable suet substitute though. Oh my gosh, Melissa, you're right! They make "vegetable suet"! Who knew? It's British, but you can order it online. It sounds revolting, but possibly less so than kidney fat, I'm not sure. A world of pudding possibilities just opened up to me! My grandmother also was English and we had Yorkshire pudding every Christmas, still do. I would love to see her recipe for that. My mom and my grandmother both put suet on top of roast beef while it was roasting so there would be lots of fat for gravy and moist meat. That fat was poured into a cast iron skillet and then the yorkshire pudding was poured in on top of the fat. It was cooked at a very high temperature and puffed up beautifully. Sounds like we need to have a baking party! Mayonnaise makes sense as it is actually made just from eggs and oil, something that is needed but not listed in the recipe. Mayo must have been readily available but eggs perhaps were more precious.